Being my first post on my new blog (I am consolidating some other blogs), it is quite appropriate to reflect on the Ultranet Experience over the last 3 years. Today feels like a bit of a milestone, a new start and a time to move forward. Although we are without the finer details, the future directions of the Ultranet appear pretty clear with this week’s announcement. Schools will be asked to opt into a ‘User Pays’ system with NEC taking full responsibility for its provision in 2014. However, reading quotes linked with this announcement such as “I think the time has come to put it out of its misery humanely” would suggest there is little hope for real provision to occur. Perhaps, the advice should have read “NEC should take responsibility for pulling the plug on its provision”. This is amongst a strange climate where some schools have waited, some have moved on already and others have yet to make any move at all. I think Martin Dixon describes this as allowing “schools to choose a system that suits their need”. Perhaps this could be described by the popular term ‘school autonomy’, which is can be interpreted as “sort it out yourself”. For all of the passionate educators who have invested time in the Ultranet, it was intended as a partnership with the government not as something we should be charged for. Personally and as a College we have invested a lot of effort in the Ultranet and although it would be easy to be bitter and twisted about Ultranet Experience there are many positives worth reflecting on before moving forward. 1. The concept and timing were both great. Just as schools were going 1:1 – BAM! here is the Ultranet. The Ultranet offered the concept of full package LMS supported by training – Spaces, Web 2.0 tools, resources, assessment & reporting, staff collaboration, consistency for staff and students..……… Although there could be lengthy discussions about what worked well and what didn’t, it did expose many of these tools to teachers and schools – A great training ground for many. Because of the time we have invested in the Ultranet we have very clear idea of what we want in a LMS, which will certainly help us move forward. We will have to find a number of tools to offer all that the Ultranet promised, but we now know what we are looking for. I don’t really think it is beneficial to sour these thoughts by carrying on about how the cost blow out or poor roll out have affected things. The concept had legs! 2. A focus of learning. I feel that the Ultranet stayed true to having a focus on Learning. On the Learning Tasks side of things we found a really good framework. Observations linked to tasks gave the opportunity to improve and increase our feedback to students. The process of attaching Learning Outcomes to our tasks online encouraged purposeful teaching. Both having a positive impact on good teaching and consistency at our College. Using technology it is easy to focus on tools rather than the learning. It is worth remembering the Ultranet is just a tool – grand in concept, but just a tool. What really has come with the Ultranet for me is the shift in how I think about teaching and learning. 3. The assessment/ongoing reporting answered a need. Quite simply the Learning Tasks side of the Ultranet is what schools needed. When demonstrations of learning in the Learning Tasks could be used for ongoing reporting it improved teacher efficiency when reporting. What seemed the most powerful aspect of this end was the creation of rich student profiles. By being able to see other teacher’s observations about students and observations from other years and schools was fantastic. Having these sorts of student profiles has the capacity to really change what we do in the classroom. Our experience with this side of the Ultranet was quite positive. 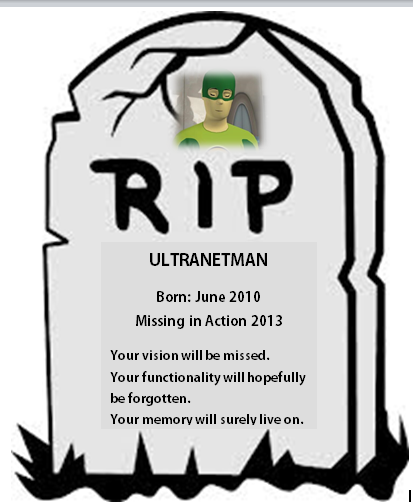 While there might be other alternatives for many of the other aspects of the Ultranet, this will be a hard hole to fill. I feel that this side of the Ultranet never really had a chance. I welcome any suggestions to fill this void. 4. The connection of Educators. What a fantastic opportunity there has been to collaborate with so many passionate educators. For me it created a great opportunity to connect with so many people over the last few years. In particular I think of the Ultranet coaches – what fantastic people, who were able to extract so much positivity in often difficult circumstances. 5. We are more aware of the support that is needed for change. It is clear that one of the big blockers in whole school change was staff capacity. Not a criticism of teachers – this is just where we are at. Not only the purpose of change needs to be clear, but the tools need to be super-easy to learn and use. In schools time is the most precious asset and it is important to recognise that the support required for these sorts of changes is significant. We had Ultranet Coaches, Lead Users, and Training Days and still only scratched the surface. Clear direction, Simplicity and Support are needed as we move forward. OK……….great to get this all said. Yes, disappointed no future funds for development to its full potential. However, I see plenty of positives from the last few years – I am calling things even. Now time to be moving on and looking at options. – Edublogs (for class blog/space). – Wikispaces – however, I feel online collaboration is moving pretty fast. Maybe some new tool for the job. Would welcome any suggestions you might have of what works well in your class, but also what might work well on a whole school level. This entry was posted in Uncategorized and tagged Ultranet on June 29, 2013 by seddonsteve.